Note: If you are not a meteorologist, you may want to skip this one. 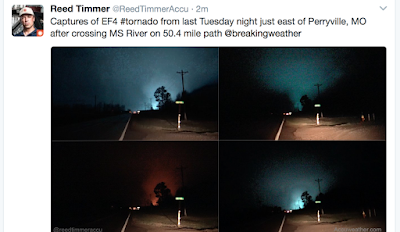 Perryville, MO tornado Tuesday night illuminated by power flashes. Photos by AccuWeather's Reed Timmer. Almost from the beginning, it has been apparent the EF-Scale was highly flawed and that Ted Fujita's original "Fujita Scale" was better. I wrote a detailed blog post on this subject on August 31, 2013, with several subsequent posts. Its wind speeds at too low, especially at the top end. 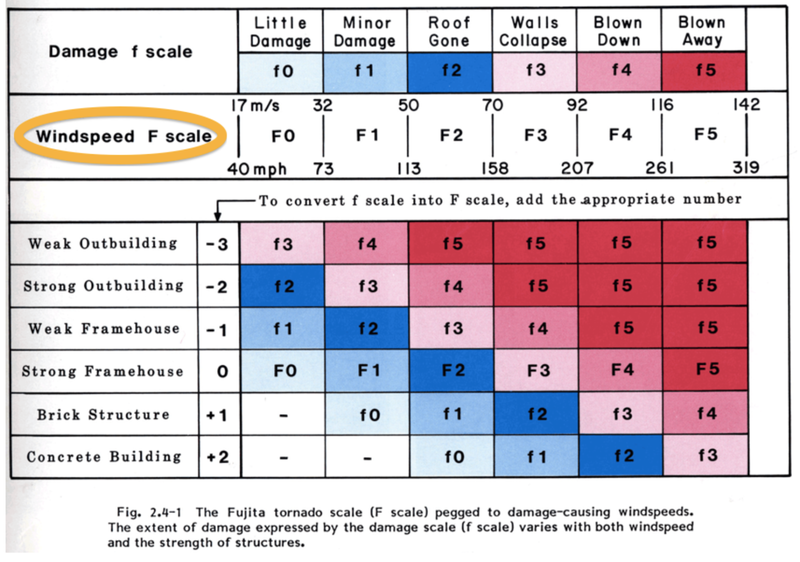 The Fujita Scale allows for direct measurement of wind speeds and the EF scale does not. The EF scale is a "damage" scale only. Here is an illustration of the latter point that the original F-Scale allows for direct measurements. The Wichita Eagle has an article, published today, written by Stan Finger on the research being done to fix the EF-Scale. Given the information in the article, they are finding that Ted's original numbers (higher wind speeds) were much more accurate than those in the EF Scale. They expect to have a third scale in about 18 months. Given the information in Stan's article, they might save themselves a lot of work and simply go back to Ted's original scale.